Whitehorn, Alan. 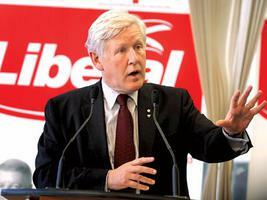 "Bob Rae". The Canadian Encyclopedia, 28 May 2018, Historica Canada. https://www.thecanadianencyclopedia.ca/en/article/robert-keith-bob-rae. Accessed 20 April 2019. While studying for a BA (1969), Rae was a volunteer in Pierre Trudeau's 1968 Liberal Party leadership campaign. As a Rhodes Scholar at Oxford, England, Rae received a B Phil (1971). Working in a legal aid clinic in London, England was a transformative personal and political experience. 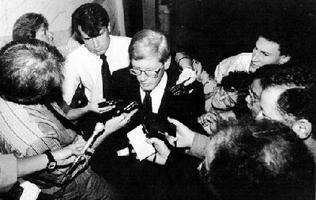 Premier-elect Bob Rae a day after the NDP victory in Ontario in 1990 (courtesy Globe and Mail). Robert Keith (Bob) Rae, CC, lawyer, politician (b 2 Aug 1948 at Ottawa, Ont.) A prominent lawyer, community activist and author, Rae has served as a federal (1978-82; 2008-present) and provincial politician (1982-96), premier of Ontario (1990-1995), interim leader of the federal Liberal Party (2011-present), and as a government-appointed official. Rae's family had substantial ties to Ottawa; his father Saul had been a senior diplomat, while his brother John was a long-time advisor to former Liberal Prime Minister Jean Chrétien. While studying for a BA (1969), Rae was a volunteer in Pierre Trudeau's 1968 Liberal Party leadership campaign. As a Rhodes Scholar at Oxford, England, Rae received a B Phil (1971). Working in a legal aid clinic in London, England was a transformative personal and political experience. On returning to Canada, Rae completed a law degree (LLB, 1977). Running for the federal New Democratic Party (NDP), Rae entered Parliament in a 1978 by-election in the Toronto riding of Broadview and was re-elected in Broadview-Greenwood a year later. As NDP finance critic, he moved the non-confidence motion that led to the historic defeat of the minority Joe Clark Conservative Party government in 1979. 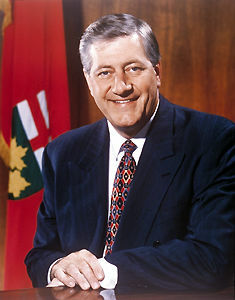 Following another federal election victory in 1980, Rae shifted to the provincial scene, where he won the Ontario NDP leadership contest in 1982. 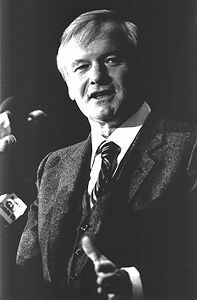 In response to the 1985 election that produced a minority legislature, Rae signed a "Liberal-NDP Accord" with Liberal leader David Peterson, allowing the Liberals to form the government after four decades of Conservative rule. Rae's NDP won a surprise election victory in 1990. As premier, Rae sought to alleviate an economic recession by spending more to stimulate the economy. As the recession deepened, the Rae government reopened labour contracts and imposed a 'social contract' (ie, days off without pay) on public sector workers. The reaction to "Rae Days" from party and union activists was swift. It bitterly divided the Ontario NDP and the labour movement. The NDP election defeat in 1995 was conclusive, although Rae was personally re-elected in his riding. He resigned as leader and Member of Provincial Parliament (MPP) in 1996 and joined the law firm of Goodmans LLP. Subsequently, Rae served in a variety of senior advisory roles, commissions, enquiries and non-governmental organizations (NGOs). He was pivotal in setting up the international Forum of Federations, assisted the Canadian Red Cross Society in its post-blood scandal restructuring, served as a director of the Institute of Research on Public Policy, advised the federal Liberal government on the Air India bombing enquiry, mediated in a native fishing crisis at Burnt Church, New Brunswick, conducted a report on post-secondary education for the Ontario Liberal government, and was engaged in leadership roles for organizations such as the Toronto Symphony Orchestra and Leukemia and Lymphoma Society. He was also appointed as an adjunct professor at the University of Toronto. Rae became disenchanted with the NDP over its policy positions (eg, Israel and economic policy). He formally joined the Liberal Party and ran for its leadership in 2006 (placing third behind the victor Stéphane Dion and old university friend Michael Ignatieff). Dion appointed Rae as co-chair of the federal Liberal election policy platform committee. In 2008 Rae was a successful Liberal candidate in the Toronto Centre bi-election and returned as an MP to the House of Commons, appointed to the shadow cabinet as Foreign Affairs critic. Though he ran for leadership in 2009 following the resignation of Dion, he withdrew from the race, and Ignatieff ultimately became party leader. Following its lackluster performance in 2011 and the resignation of Ignatieff, Rae became the party's interim leader. While Rae has moved ideologically from a left-liberal to a moderate social democrat position and back, he has been constant in his commitment to public service. A brilliant speaker, a charismatic personality, and an articulate voice for social justice and federalism, both in Canada and around the world; he has authored three best-selling books. He is also an officer of the Order of Canada. B. Rae, Exporting Democracy: The Risks and Rewards of Pursuing a Good Idea (2010); B. Rae, Canada in the Balance (2006); B. Rae, The Three Questions (1998); S. Noel, ed, Revolution at Queen's Park (1997); B. Rae, From Protest to Power (1996); P. Monahan, Storming the Pink Palace (1995); T. Walkom, Rae Days (1994); G. Ehring & W. Roberts, Giving Away a Miracle (1993); A. Whitehorn, Canadian Socialism (1992).